Bottom right button acts as a right click where the cursor is poistionned. Bottom left button acts a bit like a left click where the cursor is poistionned. #Screen 1 "Screen1" RightOf "Screen0"
#Screen 2 "Screen2" RightOf "Screen1"
text in xorg.conf file to use tablet tools . This makes installation a lot simpler and faster. See if you can use this pinstall.sh file in your pet packages. to show that the new pinstall.sh file is inside. if it already has wacom tools listed in the xorg.conf file. 2) /etc/rc.d/MODULESCONFIG is modified by shinobar's method. will load the wacom driver automatically when the desktop is formed. (shown above). I made one change however ---> option mode "relative"
modifies their xorg.conf file. This is important information to know!!! restart of X is required. kernel is used in Wary 5. 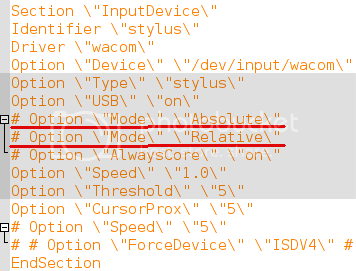 Can I use the above wacom input pet for precise puppy with 3.2.48 kernel (prcise 5.6.4)? I'll check the other versions of Precise this weekend. There's no harm in trying. for the new kernel 3.2.48. ----> a desktop file was put in by petget program. I have fixed that. Hi. Need an updated X and kernel driver for Precise 5.7.1, kernel v3.9.11. Graphics tablet Genius G-Pen F610 (reads as a "Walcom" [sic]) tablet. Thanks. ... Does any wacom driver pet package exist for Puppy Precise 5.7.1 (kernel v3.9.11)? If not, what package could be used instead? on Precise 5.7.1 but I'm not at home now so I'm not 100% certain. It won't hurt your installation to install the pet package package. Nothing is removed or overwritten. duplicate the structure of my pet package. This is ok, I will try it! ... but where could I find the right wacom source files?